Are you happy with the Bucs' hire? I think I have uncovered an NFL conspiracy. The league is trying to make Bruce Arians look good. How else do you explain the other NFL hires? Cleveland's Freddie Kitchens? The Jets' Adam Gase? Green Bay's Matt LeFluer? The Broncos' Vic Fangio? The Bengals, who might hire Zac Taylor? The Dolphins, who might hire Brian Flores? The Cardinals, with Kliff Kingsbury? I'm not trying to be a homer here, but would you trade Arians for any one of them? Any two? -- In all the hoopla (love that word) over the hiring of Bucs' coach Bruce Arians, a lot of people didn't notice that USF hired former Florida quarterback Kerwin Bell, the old Throwing Mayoan. With the USF defense, I figure Bell needs to average 109 points a game. -- This about the NHL and Brayden Point. The NHL is wrong. Period. -- Kacy Rodgers should think about this: In deciding between coaching the Giants' defensive line and the Bucs, the Bucs already have the best Giants' defensive lineman in Jason Pierre-Paul. -- A story on ESPN reminds us that we're nearing the 50-year anniversary of the Jets' upset of the Colts. Or, as I remember it, the 50-year anniversary of me losing my lunch money for the remainder of the year. I was a huge Johnny Unitas fan. Years later, when meeting Earl Morrall, it was all I could do not to scream "How could you not see Jimmy Orr in the end zone!" -- A comparison: Bill Belichick will coach in his 40th playoff game (over 24 years) this weekend. He's won 28. The Bucs have played in 15 in 43 years. They've won six. -- Oklahoma's Lincoln Riley has an unusual task in front of him. He has to replace back-to-back Heisman winners this season (Baker Mayfield and Kyler Murray). The last time that happened with different players was Army in 1945-46 with Doc Blanchard and Glenn Davis. Yale had to replace Larry Kelley and Clint Frank in 1936-37. Of course, Ohio State had to do it in 1976, but the back-to-back winners were the same guy -- Archie Griffin. -- Southern Cal came close to having back-to-back winners. Matt Leinart won it in 2004 and Reggie Bush in 2005. But Bush's award was vacated. -- CBSsports.com has an interesting thought in its mock draft. It has the Bucs trading their No. 5 pick with Jacksonville, which picks seventh. 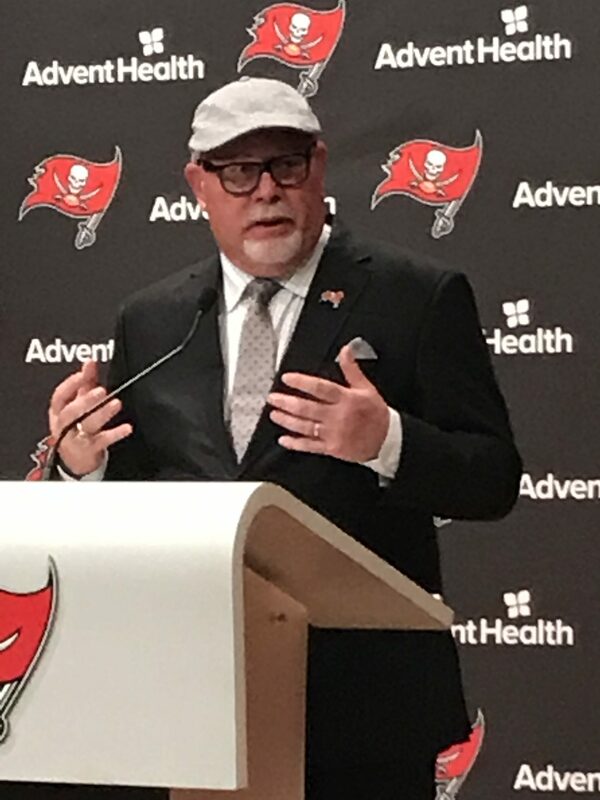 No word on what the Bucs get (a numbskull move; Tampa Bay isn't going to move back to make someone else's mock make sense), but they picked up two second-rounders for moving back from No. 7 last year. -- I guess Mike McCarthy wasn't that hot as a prospect, after all. -- Here's how good the UConn women's hoops team is. It's better for the entire sport whenever the Huskies lose, as they did the other night to Baylor, than when they win. -- It was amusing that Rex Ryan called Bill Belichick "the devil." Why not? He owns Rexy's soul. -- The trouble with Tim Tebow marrying his girlfriend, Demi-Leigh Nel-Peters, is all the money the couple will spend on hyphens when they monogram their towels. Also, she will have to get over her disappointment at not landing an NFL quarterback. Kidding. Congrats, Tim. -- USA Today lists the Bucs among the three teams that are a fit for Le'Veon Bell. It says the Colts are the perfect fit, though. If I were Bell, the thing that would really make me run would be films of this offensive line. -- Gripe all you want about the college playoff and expansion, but this year, the playoff was just fine. Anyone but Clemson saying they deserved a shot isn't paying attention. -- Hey, about an NIT for the college playoffs. Would anyone rather see Ohio State play Georgia than one of these bowl exhibitions? -- Who knew that ex-pornstar Mia Khalifa knew anything about soccer. She ripped Matteo Guendouzi of Arsenal. She thought Matteo was flopping on his back too easily, which come to think of it, is how Khalifa made her fame. -- In an article on rookie disapp0intments who should rebound next year are Vita Vea (who finished strong) and Ronald Jones (who was finished early). Vea was second on the Bleacher Report List, and Jones was fifth on the eight-player list. Gary, you mentioned the coaching team that Arians has put together. If and when the Bucs do a playoff run and maybe more how long will it take for other teams to make offers for some of them. And how have the Patriots managed to keep their championship-winning staff from together for so long? Is the answer just money? Bill, if and when the Bucs make a playoff run, other teams will be lining up to hire their assistants. It happens all the time with successful teams. From the old Bucs, Herm Edwards got a head coaching job. So did Rod Marinelli. So did Mike Tomlin. It would be the same thing with Arians’ staff. Todd Bowles will eventually get another shot. Maybe Goodwin. Byron Leftwich. But that’s only if the team is successful. There was a time, if you remember, the Bucs were afraid of losing Mike Smith. The Patriots haven’t really kept their staff together for a long time. They lost Charlie Weiss and Romeo Crennel. They lost Josh McDaniels (and got him back when he was fired). Matt Patricia. Mike Vrabel. Now Brian Flores looks as if he will get the Dolphins’ job. It’s part of the price of success. It would be a very good thing if other cities coveted the Bucs’ staff.